UPDATE - 27 PEOPLE KILLED - No organisation is owning up to it. At least 12 people were killed and about 40 injured in a powerful bomb blast at Rajprasong junction. Several cars and motorcycles were also damaged. A bomb has exploded outside a Hindu shrine in central Bangkok, killing at least 12 people and wounding many more, according to a police officer and rescue worker at the scene. Body parts and mangled scooters were scattered across the street after the explosion outside the Erawan shrine in the central Chidlom district of the Thai capital. Dozens of ambulances are at the scene and a nearby metro station has been closed. 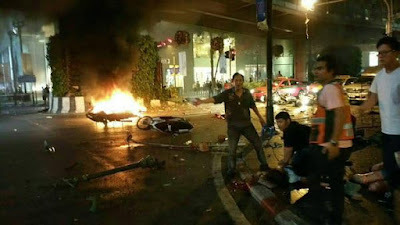 “All I can say now is there has been an explosion in central Bangkok involving a motorcycle bomb,” deputy national police chief Aek Angsananond told Reuters. He said there had been fatalities, but could not confirm details. Police and a rescue worker told Reuters 12 people had been killed, which happened at about 7pm local time (12.00 GMT). Local media put the number of injured at 20.